Hope your day is going well, and that you are creating or doing something you love to do. It seems lately that when I color an image, something goes wrong in between the finished colored image and the completed card. Like I explained with my fish card and now this one LOL. I colored this then put glossy accents on the water to give it some depth. While waiting for that to dry I started working on the actual card itself, I had just set it to the side of my scrapbook table for maybe like 5 minutes......when my adult daughter came in to talk and grabbed it to look at it before I could say that it was still really wet. 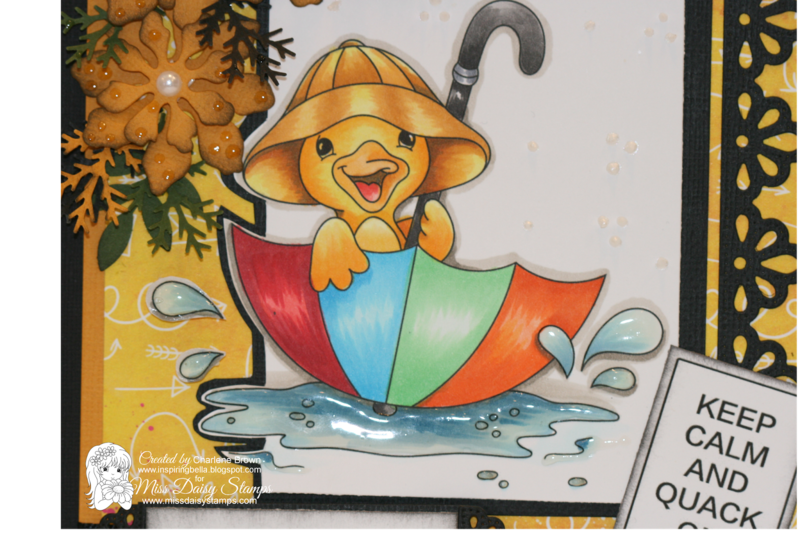 Her finger smeared through the water splashes on the left side of the card, it took me some thinking on how to create my card without actually having to re color the whole image. I originally was going to just cut a square around the image but because of the smear, I cut out the splash drops and cut around the left side of the duck and umbrella. I actually like how this turned out. I have taught card and scrapbooking classes to adults as well as children and have always said....everything is fixable ( for the most part). You can add a flower, sentiment or a embellishment to cover a lot of mistakes. 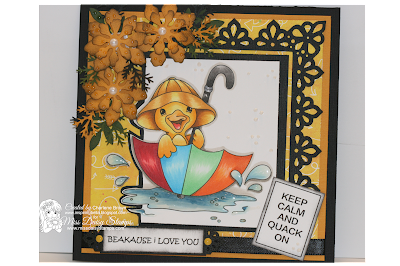 Today I am posting this card I made that is super cute and tons of fun to work with from Miss Daisy Stamps....called Umbrella Ducky. This file comes complete with bonus file sentiments, I have used 2 of them on this card. Thank you for stopping by, hope to see you next week as well.